You saw it here first! Video credits go to Juliesol73, thanks so much to her for finding these pics! VIDEO DOES NOT BELONG TO ME! What do you think? Leave a comment down below! Also, I’m sure Juliesol73 would appreciate it if you commented on her video. She’s one of the first on Youtube to have pics of Kanani! TITLE SAYS IT ALL! KANANI IS “HERE”- AND THAT’S FOR A FACT! 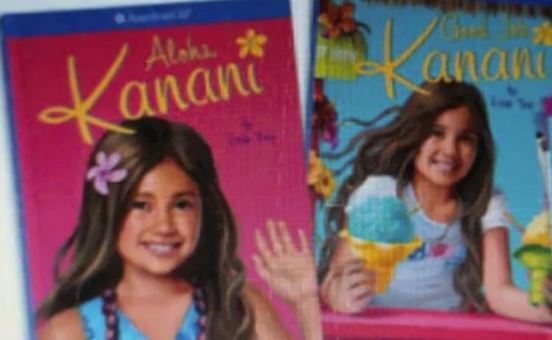 Right now I am pretty ECSTATIC and have not done much research, but apparently AG has “released” Kanani! I’m still trying to search where these slides have been found, and it looks like they are neither on the official site or the publishing site, but I’m still looking!!!!! Here’s a video of some more pics and slides!!!! Based on this video, it looks like AG is also planning to release a new Julie Mystery, 2 new Rebecca mysteries, two new Innerstar U books (one looks like soccer-themed one called “The Winning Goal”, and the other looks like a ballet one…. “Into the Spotlight”? “Paper Shaper”, “Oodles of Sweet Things”, Felicity and Josefina paper doll sets, a book called “Lend a Hand (looks like the “Friends: Making Them and Keeping Them” book released with Chrissa), and “Oodles of Ocean Creatures”(I found this on another video). I’m so excited! She is beautiful with long, wavy brown hair with highlights, almond-shaped eyes, and medium skin. I gotta see what she looks like as a doll before I consider getting her, But I am DEFINITELY reading the books and can’t wait for her debut and collection! Our Girl of the Year loves living in a beautiful tropical setting and she especially loves sharing the wonders of her island home with visitors. So when her cousin from New York comes to stay for a month, she is excited to get to know her. But no matter what she does to help her cousin feel at home, it only seems to make her unhappy instead. Can our Girl of the Year find a way to connect with her cousin? Our Girl of the Year is excited about selling shave ice to raise money for a cause she cares about. But she also cares about her best friend-and she promised they would take surfing lessons together. When our Girl of the Year can’t make time for her best friend, their friendship begins to unravel, and she finds herself spending summer days alone. Will our Girl of the Year find a way to make things right? *videos and “book info” credits to youtube user AGLoverr159. Thank you!!!! So….maybe….is it possibly possible that we can do that again? One of the reasons it is so sad is because Felicity’s time period is one of the most important to American history. Every historical doll collection, in my perspective, needs a colonial girl. Rumor has it that AG wants to replace her with a Wild West girl. Many fans think that is strange because Nicki was already kind of like that in a way. I think that Felicity can’t be replaced in a way that fans will like a new doll better. What do you think? Today I was surfing the web for American Girl Doll things, when I came upon an interesting prototype of American Girl Kit! I thought it would be nice to show it on my site! I also came across other facts and prototypes, ones that you may find interesting! Enjoy! This is the Kit Kittredge prototype sketch. Now let’s look how Kit REALLY turned out and see if we can spot the differences. 1. Kit is posed differently. One the Prototype, she is holing her pocketbook in one arm and the other is just posed outward. Her cardigan is on. She looks ready and quite peaceful. On the actual Kit, Kit seems like she has had a long day and happily coming home from school. Her cardigan is swung over her shoulder and and her other arm is lazily holding the pocketbook. In my opinion, she seems to be “walking” a little faster in the used one. The used one (I guess that’s what I’ll call it) seems to fit Kit’s personality more. 2. The main thing you’ll notice is her outfit is TOTALLY different. Well maybe not so much the outfit as it’s colors. In the prototype, Kit’s theme colors of her outfit seem to blue and cream. Her cardigan sweater set is cream and quite plain. Her skirt is actually almost identical of the used one, just way different colors, as you can see. Kit’s hat is the only thing that differs from Kit’s two outfits totally (as well as figure shape and color). In the prototype Kit’s hat is straw and almost looks like a gardening hat in my opinion. It has a blue bow over to the side. Kit’s used hat is a simpler crochet knit cap with a ribbon all the way around it and a bow to the side. Her shoes are the same. I dunno about you guys, but I like the new one better. 3. Kit’s facial expression is not the exact same. It’s not like the “same exact figure” with different clothes, but her whole self is different. Her face in the prototype is more facing us, and her short blonde bob is shiny and can be seen on both sides of her face, sort of “curling” under her chin. Her face has more freckles in the prototype and her cheeks look very like “roses”. In the newer one, her face is a little different and she looks like she is “passing by” with a friendly smile, not paying attention to you as much as the prototype. 4. The plants are not the same!!! 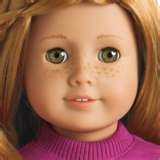 I love Kit and she is one of the most favorite of American Girl Dolls for me. I, personally, like the newer one better and think it matches her personality in the books more, what do you think? Tell us! 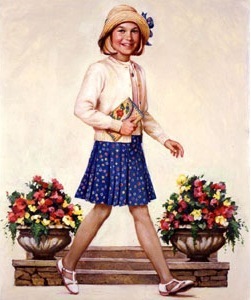 The Sonali mold was not originally made to be a Sonali mold when American Girl chose to make one of it’s sort. It was first going to be the “Mia Mold”. That’s right, Girl Of the Year 2008 Mia. There had been many rumors about the red-head. She was at first thought to be Japanese like her author and wear glasses. Another rumor said that she was African American. Maybe this rumor almost came true. Facts show that prototypes of the Sonali mold wear made for Mia. Why do you think they decided to change it? That may be a question unanswered. 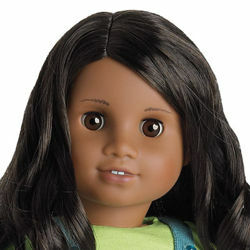 However American Girl first used their “Mia” mold on Sonali, who was 2009 Girl Of The Year Chrissa’s best friend, along with Gwen. The three dolls and their collection retired in January 2010. Thye have also used this mold on Just Lie You Dolls. However, no Historical Doll bears the mold. But Kaya, Girl of 1764, as an unusual mold. Her mold is the only mold with a mouth closed. Her face also resembles the Bitty Twin Brunette Girl. Mia St. Clair. This is how the Girl Of The Year 2008 turned out to look like, bearing the Classic Mold, first used on Molly, Kirsten and Samantha. Why do you think companies change their ideas or use prototypes? Do you think the change of their products help them sell better?